I have a different type of a post today, and it's about being rewarded for loyalty through different incentives from various retailers. I'm not talking about freebies or half price special offers that any old sod can avail of, I am talking about retailers going above and beyond to thank and reward continuing customers for their loyalty. Today, I visited Lush and Brown Thomas and in return for some empty containers which were no good to me anyway, I got a lovely new fresh face mask and a new MAC lippie. I am a big fan of MAC and Lush and I call into their store very regularly because I like their products, and have been a longtime fan of both. I don't particularly need any incentive to shop there, and I return to these stores all the time because I associate them with quality products that have already earned my seal of approval. I think it is a great concept, and it actually fills my heart to think that customer loyalty is rewarded, and this concept of rewarding customers for their loyalty seems to be catching on. I appreciate loyalty in every strain of life, personally and professionally, and the fact that there are companies that also appreciate loyalty is very encouraging. MAC- Back to Mac- return six empty plastic containers to the store and pick out a lipstick of your choice for free. No purchase necessary. Value €18. 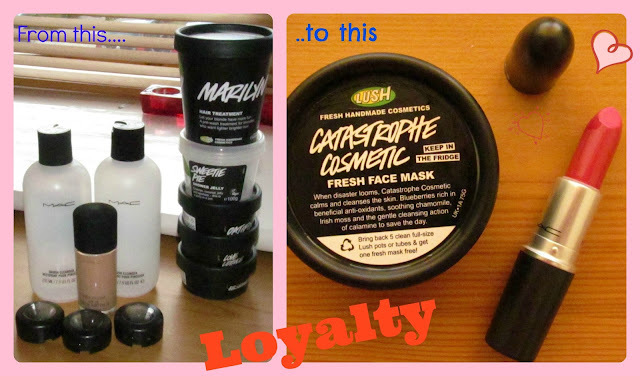 Lush- Bring back 5 clean full-size Lush pots or tubes and get one fresh mask free. Value €8.95. The Body Shop- Love Your Body- Ok so technically you have to pay to get the card, but it's just a nominal amount, and the benefits far outweigh any outlay. First off, you get a 10% discount on presentation of your card at the till. You get a stamp instore if you spend €15+, and once you have collected four stamps, you get a free gift up to €10, and once you collect all 8 stamps, you get a free gift worth €15. AND if that's not kind enough of The Body Shop, you also get a free birthday gift to the value of €10 if you call into The Body Shop the month of your birthday! If you visit The Body Shop regularly, this is a great reward of your loyalty. These are the main ones that sprung to mind today, but other beauty related ones include the Debenhams and Brown Thomas reward cards. If there are any incentives that you think are worthy of a mention, please drop a comment and let us know. Sharing is caring after all! I love those schemes where you bring the empties back! Makes me use the product more instead of forgetting about it on the shelf! I love back to Mac! I love using it to try out new lipsticks you might want to try but not actually spend money on.